The purpose of this article is to explain Artificial Neural Network (ANN) and Long Short-Term Memory Recurrent Neural Network (LSTM RNN) and enable you to use them in real life and build the simplest ANN and LSTM recurrent neural network for the time series data. 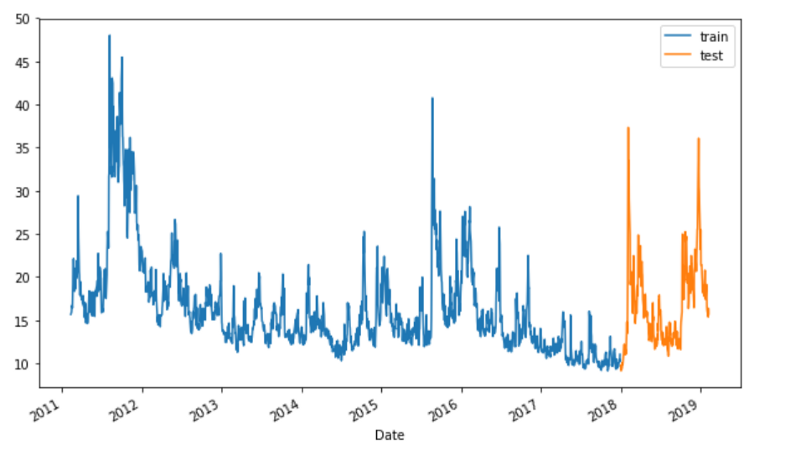 The CBOE Volatility Index, known by its ticker symbol VIX, is a popular measure of the stock market’s expectation of volatility implied by S&P 500 index options. It is calculated and disseminated on a real-time basis by the Chicago Board Options Exchange (CBOE). 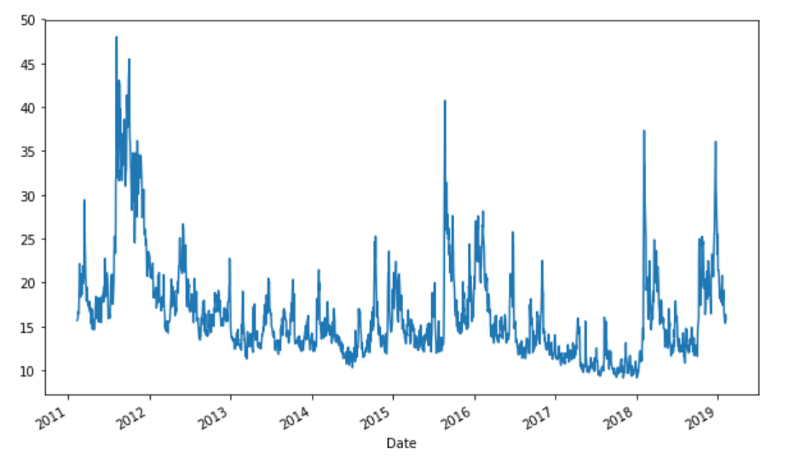 The VOLATILITY S&P 500 data set can be downloaded from here, I set the date range from Feb 11, 2011 to Feb 11, 2019. 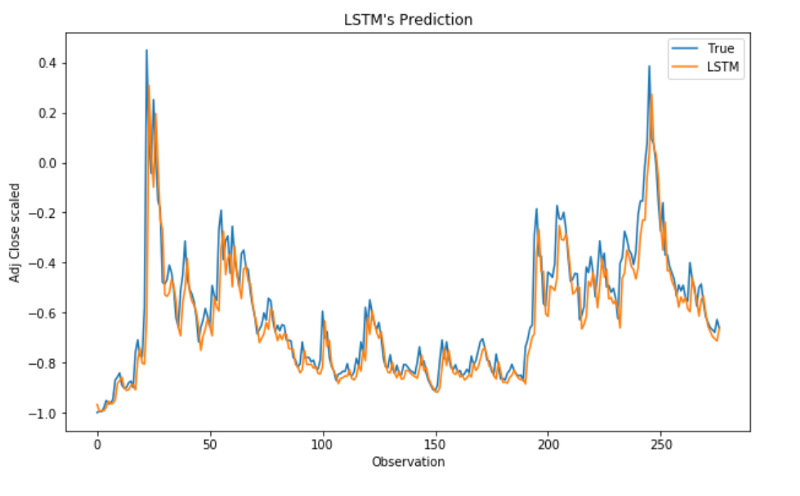 Our goal is to predict VOLATILITY S&P 500 time series using ANN & LSTM. And load the data into a Pandas dataframe. We can have a quick peek of the first few rows. 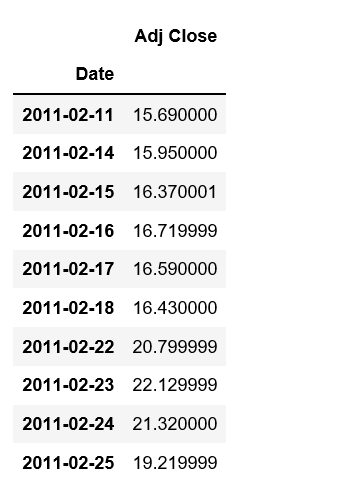 We will drop the columns we don’t need, then convert “Date” column to datatime data type and set “Date” column to index. Next, we plot a time series line plot. As can be seen, the “Adj close” data are quite erratic, seems neither upward trend nor downward trend. We split the data to train and test set by date “2018–01–01”, that is, the data prior to this date is the training data and the data from this data onward is the test data, and we visualize it again. We scale train and test data to [-1, 1]. Get training and test data. We create a Sequential model. Add layers via the .add() method. Pass an input_dim argument to the first layer. The activation function is the Rectified Linear Unit- Relu. Configure the learning process, which is done via the compile method. A loss function is mean_squared_error , and An optimizer is adam. Stop training when a monitored loss has stopped improving. patience=2, indicate number of epochs with no improvement after which training will be stopped. The ANN is trained for 100 epochs and a batch size of 1 is used. I will not print out the entire output. It had an early stopping at Epoch 19/100. When constructing LSTM, we will use pandas shift function that shifts the entire column by 1. In the below code snippet, we shifted the column down by 1. Then we will need to convert all our input variables to be represented in a 3D vector form. The LSTM networks creation and model compiling is similar with those of ANN’s. The LSTM has a visible layer with 1 input. A hidden layer with 7 LSTM neurons. An output layer that makes a single value prediction. The relu activation function is used for the LSTM neurons. The LSTM is trained for 100 epochs and a batch size of 1 is used. It had an early stopping at Epoch 10/100. Both training and test R^2 are better than those of ANN model. We compare test MSE of both models. That was it! 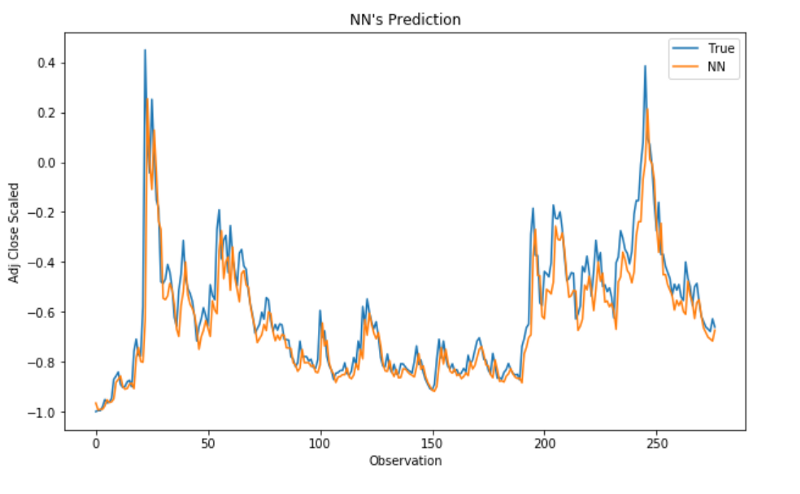 In this post, we have discovered how to develop ANN and LSTM recurrent neural networks for time series prediction in Python with the Keras deep learning network, and how can they be leveraged to better predict time series data. Jupyter notebook can be found on Github. Happy Monday!